Accra, April 28, GNA - Peter Assandoh, trainer of Ghana's super featherweight boxer Kpakpo "the Exciting" Allotey said the knockout verdict against his ward in a Commonwealth title fight in Glasgow last week was the worst decision he had ever seen in his long association with boxing. "The stoppage smacked of gross partiality and discriminative justice as the referee failed to invite the ringside doctor to examine the scratch on Kpapko's face before halting proceedings." He said Kpakpo dominated the fight from the first round to the fifth and was never in any danger until his opponent Craig Docherty head butted him thereby opening a "slight cut " on his eyebrow. Assandoh who was a world rated middleweight boxer in his hey days with a record of 270 fights, 150 knockouts, 112 unanimous decisions, four draws and four loses said he was surprised the referee did not even caution Docherty for his illegal blow. The coach said he and many other people present at the fight, including some Scottish fans were stunned beyond comprehension when the referee stopped the fight early in the sixth round because Kpakpo's wound was not bleeding and he was not in any danger at all. He said the irony of the referee's decision was that Docherty bled profusely from a "deep gorge" in first round in his previous fight with Malik Jabir but was allowed to stay on and he eventually ran away with a favourable decision. The coach said the managers of Kpakpo were willing to make the film available to the Ghanaian viewing public as soon as it arrived from London to confirm their stance and to serve as a warning to other Ghanaian boxers. 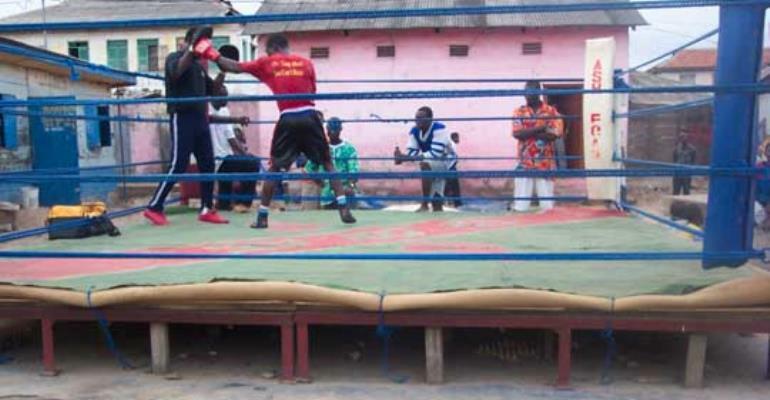 Assandoh said he believed other Ghanaian boxers might have lost fights under similar circumstances and called on the Ghana Boxing Authority (GBA) to spearhead a move to compel the Commonwealth Boxing Commission to appoint independent observers at all title fights. Commenting on the decision, Mr Reg Hansen Thompson, president of the Akotoku Academy, managers of Kpakpo said though it was bizarre, he was not deterred by the machinations of the Scot promoters and officials because it was evident that Kpakpo was a stronger and a better boxer than Docherty. He said he believed that anytime they meet in an impartial environment, the Scot would not last the distance, adding that he did not consider the result as a blemish on Kpakpo's record but as one big lesson to grapple with in his quest to become a world champion. Mr Thompson said he still considered Kpakpo as a potential world champion who would sparkle soon and bring glory to Ghana and Akotoku Academy.